Overhead Door Co. of Burlington has been serving customers in the Hanover, NH area since 1948. As we’ve grown to become one of the largest overhead garage door and electric operator installation companies in Vermont, New Hampshire and surrounding areas, we’ve learned a thing or two. Throughout all the change in the technology, materials and standards our industry has experienced, one thing remains constant. And that’s that Overhead Door Co. of Burlington offers quality garage door installation, repair, and maintenance services in Hanover, NH. Receive residential and commercial garage doors services from the best: Overhead Door Co. of Burlington. Dial (802) 448-4752 or contact our professional garage door installers online. Whether you’re hoping to have a new garage door installed in your home or place of business or want to replace a few windows, give us a call at 802-448-4752 or fill out a contact form today! We offer a myriad of high-quality garage doors for installation and replacement projects, with popular options available like steel, wood and aluminum. Your garage door is a major investment, and the quality of the installation work is just as important as that of the product itself. 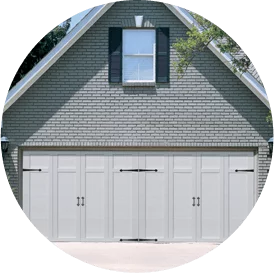 At Overhead Door Co. of Burlington, we offer the highest quality garage doors for our residential clients in Hanover and can help ensure smooth operation with proper installation and maintenance. Learn more about our residential garage door service today! Having high quality, functioning doors in place at all times is critical for any commercial facility in the Hanover area. If your garage doors break or need to be replaced, service must be completed right away to ensure your property remains protected from theft and the elements. Overhead Door Co. of Burlington uses the best quality commercial door products, garage door openers and dock equipment. Learn more about our commercial door service. Why Choose Overhead Door Co. of Burlington? Ready to schedule services in Hanover, New Hampshire? For garage doors, insulation, windows and more, you can count on Overhead Door Co. of Burlington! Call us today at (802) 448-4752 or contact us online.